Brain Tumor - body, contagious, causes, What Is a Brain Tumor? A brain tumor is a mass of abnormal cells growing in the brain. Despite its frightening name, not all brain tumors are cancerous or fatal. A brain tumor is a clump of abnormal tissue that can be found anywhere in the brain. The brain and spinal cord form the central nervous system, which controls everything a person does on purpose (such as walking and talking), or automatically (such as breathing and digesting food). This system also controls people's senses, emotions, thoughts, memory, and personality; it determines who they are. Brain tumors are categorized in two ways: first, by how they look during imaging tests that create pictures of the brain, and by how the tissue appears under a microscope; and second, according to whether they started in the brain or spread there from another part of the body. Benign brain tumors have clearly defined edges and contain cells that look healthy, just like normal cells. They tend to grow slowly, are not likely to spread, and rarely grow back once they are removed. The word "benign" means harmless, although these tumors may cause harm if they start to interfere with normal brain function. Benign brain tumors are not cancerous. Malignant brain tumors are also called brain cancer. They can have irregular borders and they are made up of abnormally shaped cells. They tend to spread quickly by sprouting new "roots" into surrounding brain tissue, almost like a plant in the soil. While they may also spread to the spinal cord, they generally do not spread to other parts of the body. In some cases, one tumor may contain a combination of nearly normal and extremely abnormal cells. Primary brain tumors originate in the tissues of the brain and may be either benign or malignant. Secondary brain tumors are actually formed from cancer cells that have traveled to the brain from another part of the body. For example, cells from tumors in the lung, breast, or somewhere else can spread to the brain and cause new tumors to grow. Secondary brain tumors are always malignant. In addition, brain tumors are classified by the type of brain cell that became a tumor, with medical names such as astrocytoma (as-tro-sy-TO-ma), glioma (glee-O-ma), ependymoma (e-pen-di-MO-ma), germinoma (jer-mi-NO-ma), medulloblastoma (med-yoo-lo-blas-TO-ma), meningioma (me-nin-jee-O-ma), and neuroblastoma (noor-o-blas-TO-ma). Their common ending "-oma" means "tumor," and the beginning indicates the part of the brain where the tumor forms. For example, gliomas, the most common type of brain tumor, form in the supportive tissue of the brain, called the glia. The second most common type, meningioma, forms in the meninges, the membranes that cover the brain and spinal cord. Why Do People Develop Brain Tumors? Doctors cannot explain why some children and adults develop brain tumors. When it happens, it is not their fault, nor could they have done anything to prevent it. Even though a tumor can spread within the brain, it cannot spread from one person to another; in other words, brain tumors are not contagious. Researchers have found that some brain tumors are more common in people who are frequently exposed to certain industrial chemicals used to manufacture rubber, pharmaceuticals, crude oil and petroleum, and nuclear fuel and weapons, as well as agricultural chemicals used on farms. They also are investigating whether certain viruses may contribute to brain tumor development. Heredity is another possible cause under investigation. Because brain tumors sometimes occur in several members of the same family, researchers are investigating whether the tendency to develop them may be inherited. Seizures, or sudden movements or changes in consciousness over which the person has no control. Weakness or loss of feeling in the arms or legs. Stumbling or lack of coordination in walking. Abnormal eye movements or changes in vision. Changes in personality or memory. How Do Doctors Diagnose Brain Tumors? In addition to asking about symptoms, the doctor performs a neurological exam, which involves different tests of vision and eye movement, hearing, reflexes, balance and coordination, memory, thinking ability, and other functions controlled by the brain. Brain tumors affect people of all ages. Among children and young adults who have tumors, it is one of the more common types diagnosed. Still, childhood brain tumors are relatively rare: the American Brain Tumor Association estimates that only about 4 of every 100,000 children under age 20 will develop a brain tumor. Back in 1946, one such child was Johnny Gunther, whose father wrote the widely read book Death Be Not Proud about Johnny's experiences. At the age of 16, Johnny started experiencing some vision problems and a stiff neck. After a series of tests, he was diagnosed with glioblastoma, a fast-growing tumor that tends to spread quickly within the brain. The book describes the diagnostic tests that Johnny underwent and his treatments, including surgery and radiation therapy, which was called x-ray therapy at that time. Johnny's father also recounts how the family coped with the disease and the eventual knowledge that Johnny would not get better. Johnny died in 1947 at the age of 17. Johnny's tumor is not typical of all brain tumors. Some grow much more slowly and do not invade the surrounding tissue. Gunther notes that while his son's tumor looked like a spider stretching out its legs, another type might look more like "a marble stuck in jelly." Treatment methods for all types of brain tumors have advanced since 1946, making it easier for doctors to remove them and control their growth. Johnny's doctors had to rely on x-rays, vision tests, and a brain wave test called an electroencephalogram to locate his tumor. Now, doctors use CTs, MRIs, and other new computer technologies to create visual "maps" of the brain and pinpoint a tumor's exact location before and during surgery. Doctors often use MRIs (magnetic resonance images) as part of the diagnostic process. Here a brain tumor shows up as a roundish spot that differs from the healthy brain tissue nearby. involves injecting dye into a blood vessel and creating a series of images as the dye moves through the brain. This helps doctors to visualize the tumor and the blood vessels leading to it. Surgeons performed the first successful removals of brain tumors during the 1880s. Follow-up care was difficult, however, and many patients died afterward. During the early years of the twentieth century, Dr. Harvey Cushing (1869—1939) pioneered the specialty of neurosurgery in the United States. Dr. Cushing made certain that all types of tumors were classified before surgery based on analysis of the tumor's pattern of growth and on observation of tissue samples. His work also revolutionized post-operative care, which reduced mortality among tumor patients. Dr. Cushing's achievements are reflected in today's surgical techniques, clinical expertise, and laboratory research. Once a tumor is found, doctors often need to gather more information to figure out what type it is. In some cases, the doctor takes a sample of the cerebrospinal fluid that surrounds the brain and spinal cord, and then sends the fluid to be examined under a microscope. More commonly, surgeons will remove part or all of the tumor in a process called a biopsy, and then send the tissue to the laboratory for analysis. To get at the tumor, they open part of the skull (a procedure called craniotomy), or they may drill a small hole in the skull and use a needle to take a tissue sample. 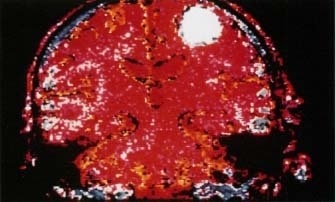 Both before and sometimes during the operation, surgeons use computerized images of the brain to help them locate the tumor and avoid the nearby healthy tissues that are essential for normal function. How Do Doctors Treat Brain Tumors? Surgery, radiation therapy, and chemotherapy are the three most common treatments for a brain tumor. But the type of tumor, its location, and the person's age often determine how these treatments are used. Before the process starts, most patients are given medications to relieve any swelling in the brain and control the seizures that often occur with brain tumors. During surgery, surgeons attempt to remove the entire tumor. However, if the tumor cannot be removed completely without damaging vital brain tissue, then they will remove as much as they can. Surgery is usually the only treatment needed for a benign tumor. Radiation therapy (also called radiotherapy) is the use of high-powered radiation to destroy cancer cells or stop them from growing. It is often used to destroy tumor tissue that cannot be removed with surgery, or to kill cancer cells that may remain after surgery. Radiation therapy is also used when surgery is not possible. External radiation comes from a large machine, while internal radiation involves implanting radioactive material directly into the tumor. Even though the radiation is focused on the tumor, some of the surrounding healthy tissue is often damaged as well. Therefore, doctors avoid giving radiation to very young children, especially those under age 3, because their brains are still developing. These children are often treated with chemotherapy until they are old enough to have the radiation therapy. Stereotactic surgery uses a frame attached externally to the skull. The frame allows the surgeon to attach surgical instruments and to position them precisely. Before surgery, tumor locations are identified using computerized tomography (CT) or magnetic resonance imaging (MRI). The surgeon then drills a small hole in the skull and, using the CT or MRI data, inserts the instruments and navigates to an exact point in the brain. The surgeon can then remove a tumor or perform other procedures. Doctors often use stereotactic surgery to guide biopsy needles and forceps, to guide electrodes for recording or marking lesions, to guide lasers, to insert endoscopes for looking inside the body, and to guide Gamma knife procedures, which use radiation to do surgery. During chemotherapy, doctors give anticancer drugs by mouth or by injection into a blood vessel or muscle. Because the body automatically tends to prevent chemicals and other foreign substances from entering the brain and spinal cord (a kind of "self-defense" mechanism), doctors may need to inject them right into the spinal fluid. 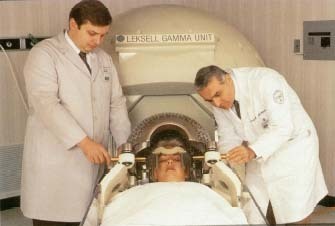 Gamma knife radiosurgery is one of the treatments doctors use for brain tumors. Using technology from linear particle accelerators and cyclotrons to produce a proton beam or gamma radiation, doctors direct the beam for ultra-precise surgery, assisted by three-dimensional computer images constructed by super fast computers. Gamma knife radiosurgery can be performed in a single day, and patients usually can go home the next morning. © 1990 Custom Medical Stock Photo. Numerous other treatments for brain tumors are being evaluated in research studies called clinical trials. For example, researchers are testing biological therapies that try to "supercharge" the body's disease-fighting immune system against the tumor. They also are testing drugs that would prevent tumors from creating the new blood vessels they need to keep growing. In the United States, the National Cancer Institute has formed groups of doctors nationwide who are working together to find new treatments for brain tumors in children and adults. Sometimes, the tumor or the treatment damages some of the nearby healthy brain tissue that controls physical and mental function. Patients need to work with a special therapist if they are having trouble using their arms or legs, maintaining balance, speaking, swallowing, or expressing their thoughts. They may feel tired or depressed, and they may experience personality changes. Children may find that they have problems with learning or remembering what they learn when they return to school. Gunther, John. Death Be Not Proud: A Memoir. New York: HarperPerennial Library, 1998. First published in 1949. Roloff, Tricia Ann. Navigating Through a Strange Land: A Book for Brain Tumor Patients and Their Families. Indigo Press, 1995. U.S. National Cancer Institute (NCI). One of the National Institutes of Health, NCI publishes brochures about cancer, including the fact sheet What You Need to Know About Brain Tumors. American Brain Tumor Association, 2720 River Road, Des Plaines, IL 60018. The ABTA offers free publications about brain tumors, including A Primer of Brain Tumors: A Patient's Reference Manual, Alex's Journey: The Story of a Child with a Brain Tumor (especially for children ages 9 to 13), Dictionary for Brain Tumor Patients, and many others. National Brain Tumor Foundation, 785 Market Street, Suite 1600, San Francisco, CA 94103. NBTF publishes Brain Tumors: A Guide and its website features descriptions of different brain tumor types, survivors' stories, and a physician interview.